It's Facebook Fridays! for November 3, 2017, and it's time to set your heart on fire! The Lucky Mojo Curio Company is holding a random drawing to give away 5 love-igniting spiritual supply prizes that keep romance ablaze. 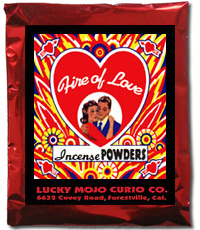 This week, each lucky winner will receive a bottle of hand-made Lucky Mojo brand Fire of Love Dressing Oil, along with a packet of Fire of Love Incense Powders. Anoint yourself or your candles with the oil and burn the incense with a special prayer-wish before you go to meet your lover. First thing tomorrow morning, we will select FIVE winners at random, announce their names here, and ask them to message this Facebook Page with their mailing addresses, so we can send them their FREE Fire of Love products. We have a winner! In fact, we have 5 lucky winners! Our Facebook Fridays! winners for November 3, 2017 are: Tammy Gail, Danielle Maddie, Lynda Hunter, Karen Ellis Fahey, and Tameka Johnson.